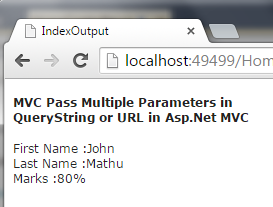 This article will show you how you can MVC Pass Multiple Parameters in QueryString or URL in Asp.Net MVC using c#. In this you will learn to pass and access multiple QueryString value in URL in asp.net mvc using c#. 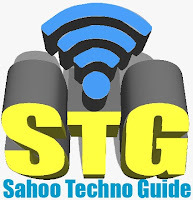 Some of my previous articles are as follows: jQuery Articles, Partial view in Asp.Net MVC, jQuery Ajax Search and Display In MVC WebGrid in Asp.Net MVC Using C#.Net, Search and Display Data In MVC WebGrid in Asp.Net MVC Using C#.Net, Hyperlink Adding In MVC WebGrid in Asp.Net MVC Using C#.Net. So for this article first will create a new asp.net mvc application and add a controller file and in this we will add two action method. One for providing link and in which we will pass the value and other for accessing the request querystring value. In above code I have passed the request QueryString by storing into ViewData to display in view. Now we will create the view and add the below code. Here we have displayed the value. Now we have done run the application to check the output. Now click on link. After this we will hit the break point. So here check the we are getting request querystring value. Thank you Sir... you are realy help full. How would such a map definition look like?